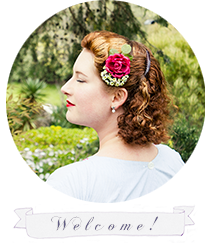 This is a simple tutorial on how to crochet a flower hair clip like the one above. You might have noticed me wearing it in my hair in my last Mother & Daughter outfit post? Anyway, now you can make one just like it for yourself! I used a 1.75mm hook with my yarn. For your standard 3-4 ply wool, a 2.00 - 3.25mm hook is recommended. Hook & yarn chart. Row 1: *Dc, ch1, dc* in fifth ch from hook. *Ch1, sk1. Dc, ch 1, dc in next stitch* till the end (repeat 8 times). You should end up with 9 double crochet V’s. Ch 3 and turn. Row 2: In first ch1 space between the double crochet V’s, dc 4 times. *Sl st in next ch1 space between the double crochet V’s. Dc 5 times* till the end (repeat 9 times). Sl st in last stitch in row. Step 1: Fasten off and leave long tail for sewing. With the tail on the right side, roll the flower inwards (clockwise motion), placing the petals how you would like and sewing to hold it in place. Row 5: *8 dc in ch space, dc in next dc, continue from * across – finish off with sl st leaving a long tail to sew the clip on. Step 2: Take flower centre and roll the outside petals around it, sewing the petals in place with the rest of the flower centre’s tail. Step 3: Using the flower petals’ long tail sew the hair clip finding onto the back of the flower.